As we enter into football season I couldn't think of a more perfect time to share this ghost story I stumbled upon. Published on May 1, 1960 in Chicago tribune this story was noted as a reprint from Inland magazine. I found this newspaper article a few years back while conducting research for historical sources for my advocacy on #changethename. What I found most fascinating about this story was the feeling that it was not just any regular old ghost story, but that it could be so representative of the many layers associated with the Redskins slur, as well as the history of colonialism in the United States. Within my advocacy I have tried my best to bridge that connection of recognizing the origin of the slur as well as the codified anti Native sentiments that the slur contains to debunk the claim ( most prevalently weaponized as a micro invalidation) that the slur is an “honor”, to give recognition to the ways it has influenced settler schema of dominant culture. Elements of the fear plot device in this short ghost tale are settler anxiety and guilt that come as a result of settler occupation. A settler, scared by the feeling of being chased by a screaming Indian on horse back along a railroad track. Beyond the fact that a “Redskin ghost” must have been a scare factor to settlers at the time just based on the fact that Natives were dehumanized and othered; The dynamic of which this otherization was inscribed was during times when settlers were invading upon Native territories, later settler relatives and descendants were then capitalizing on that wealth. Settlers experienced resistance to their encroachment, and it was out of that anxiety as well as in their justification for conquest, that hostile savage tropes were born. Such tropes including the “Redskins” and Native mascot industry in itself, are rampant within colloquialisms, caricatures, and chants about “Redskins on the warpath” and scalping. While I have broke down plenty of times the many caricatures associated with redskins trope, that are very clearly inaccurate and anti Native in their function, it is a conversation that could be rehashed over and over. Alas, I move forward to unpack this ghost tale by giving historical context to these dynamics through the underlying symbolism and dynamics in this story. Before the story even begins the author mentions a famous Frederic Remington painting called “America on the Move” “showing an Indian trying to keep up with the white man’s speeding train”. Remington’s paintings are known for showing the public vision of expanding in the Wild West. An introduction with a familiar sentiment of “American Progress” paired with western expansion as illustrated in John Ghast’s “American Progress”. The juxtaposition of the Indian on the horse struggling to keep up, not only alludes to noble savage tropes but also frozen in time tropes and ultimately impending progress of industrialization. Underlining the fact that it is “the white man’s train” that is juxtaposed, to establish a binary. Ultimately I find it explanatory of who primarily reaped the profits of the industrial revolution, dispossession of Natives, and arbiter behind the exploitation of forced labor, which put railroads and the system of mass production in place, the white settler. I also can't help but ignore the location of the tale in Minneapolis. 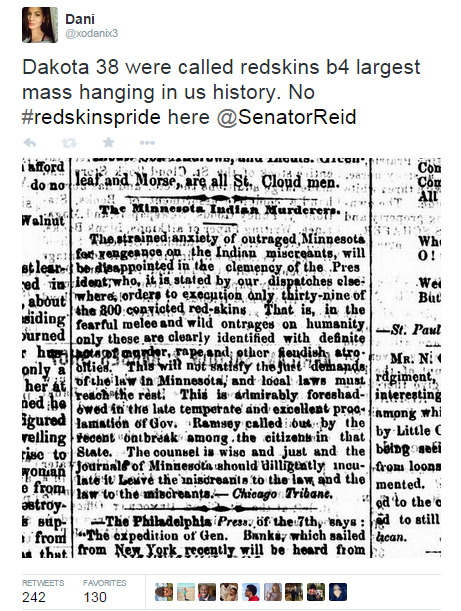 I have outlined the ways the redskin slur had been used in the past with negative connotation to demonize Oceti Sakowin people, specifically in reference to the Dakota 38 (the largest mass hanging in US history) who were demonized as redskins in an article about the execution. That context is important when considering the fact that Dakota people were historically exiled from homelands in Minnesota, and even worse, forced into prison camps where many suffered and passed away. This is a history that is heavy and not to be taken lightly. Although many other references I have found referring to Oceti Sakowin people with negative connotations in response to their resistance against colonization, such as the Lakota in Pine Ridge, dancers in the Ghost Dance movement, and many more. The history of the relationship of the redskins slur with Oceti Sakowin people across multiple sources historically has been negative. That dynamic is again reiterated with the fact the the ghost in this story is specified as a “Sioux warrior”. Its also interesting to note that there were other Tribes present in Minnesota such as the Chippewa and Hochunk, so why is it that this story chose to depict a "Sioux warrior"? This happens to be the dynamic of pan indianism, erasure, and savage tropes because of plains Natives stereotypes that persist in popular narratives. The setting of the story took place along train tracks and land that had been built upon and occupied by settlers. Beyond recognition of the colonization and Native dispossession that took place I also recognize the role that industrialization played in this history. Railroads were forced onto Native lands and that in itself speaks to the forced displacement. A book by Robert H Frost details the negative impact railroads had on the Pueblo. But the other element of colonization and industrialization the often goes overlooked, is the fact that these systems could not have been successful without the labor of Black Slaves and other minorities that had immigrated to the Americas. Another less acknowledged fact, is the ways Native people were forced to labor on railroad tracks as an act of colonization as well. This is yet another layer to the guilt of injustice that goes unaddressed and continues to haunt American identity and ontology. 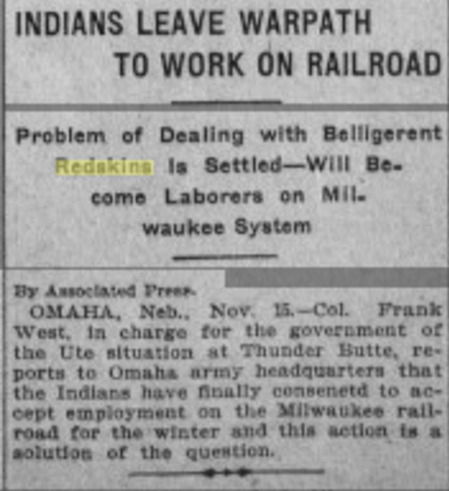 Ute Indians were forced to work the Milwaukee railroad. Notice the use of "Redskins" doesn't appear to be used in positive way next to "Belligerent"
Mention of the threat of tearing up train tracks and derailing trains, at Font Du Lac Minnesota. Clear demonstration of Native resistance in the face of industrialization. Could it be possible that stories such as this were born out of the unconscious or residual guilt that settlers felt not only for residing upon Native land, but also the violence that took place to establish their systems of wealth? To say so would be a optimistic outlook on such a depiction that stigmatizes a Native ghost as hostile with such descriptions as “the indian being hideously painted” “letting out a blood curdling war whoop”. The depiction acted as a justification to continue lumping Natives as the “other” and to paint settlers as the civilized, scared victims being terrorized by the “savage” Indians nonetheless. I also can't help but note the irony of the verb “relentless” in the title, very similar to other language used by colonizers to dehumanize Natives in the past, such as “Merciless Indian Savages” on the Declaration of Independence. In multiple sources of my research I find the word "belligerent" coinciding with use of the word "redskins", once again reiterating the savage trope dynamic inherent in Native racial tropes and the monikers that uphold them. In conclusion, it's amazing how much one little ghost story can tell about the history of colonization. While this article was a bit heavy in subject matter and analysis, I must admit it was fun to think about what types of ghost stories were told and I wonder how many must be floating around like this one. Imagine how strange it would be to open the newspaper today and see such a story? I hope this will lead many to broaden their understanding on the word “redskins” as well as examine the racial tropes inherent in various horror tropes in order decolonize horror. You can read more about settler anxiety and my article about the Indian burial ground trope here.